Hannah was born and raised in Mankato, Minnesota. She completed her Bachelor's Degree in Philosophy at Hamline University. She then went on to study law at Mitchell Hamline College of Law. 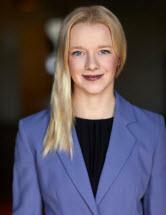 Hannah assists clients in a broad range of litigation matters. She is a passionate advocate and adviser for her clients, and finds serving her clients deeply rewarding. When she is away from the office, she enjoys hiking in nature, spending time with family and friends, and practicing yoga and water sports.